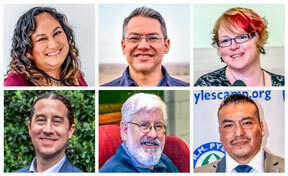 Congratulations to our 2018 Distinguished Alumni Award Winners! Corey Gray (‘97, Physics & Applied Mathematics) is a lead operator for Laser Interferometer Gravitational-Wave Observatory in Washington and is part of a group of researchers that discovered the existence of gravitational waves produced by two colliding black holes, marking a major discovery for the fields of physics and astronomy. Jennifer Kho (‘99, Journalism) has made her mark in journalism as a reporter, editor, and newsroom leader for major news outlets, and is currently the managing editor of the HuffPost. Before that, she was managing editor of the Guardian US. Eliberto “Eddie” Ramos (‘99, Sociology) is a Psychiatric Social Worker for the Los Angeles County Department of Mental Health’s Court Linkage Program. Serving as a bridge between the courts, the community, and clients in the L.A. criminal justice system, he works on alternative sentencing and rehabilitation plans for adult offenders. Tim Rine (‘97, Business Administration) is the executive director of the North Coast Clinics Network, a consortium of community health centers that support vulnerable and underserved residents in Humboldt, Del Norte, and Trinity counties. Under Rine’s leadership, NCCN became a recognized leader in California for its regional coordination of quality rural health care. Craig Tucker (‘74, Zoology) is recognized as a leader in warmwater aquaculture and is considered by many as the father of the catfish industry. Tucker’s research helped the catfish industry grow from a local farming activity to the largest producer of cultured seafood in the United States. Brandie Wilson (‘09, Sociology, ‘11, M.A. Sociology) is founder and executive director of the Humboldt Area Center for Harm Reduction, which seeks to improve Humboldt County’s overall rating on the Healthy Communities Index. 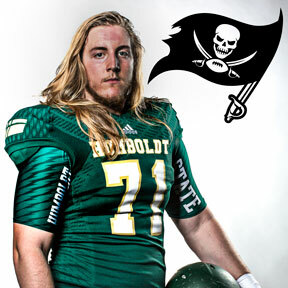 Congratulations to HSU’s Alex Cappa! He was recently picked in the 3rd round of the NFL Draft. 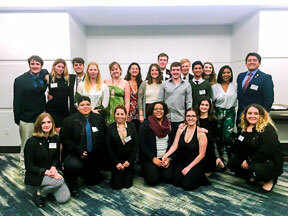 Fund helps break down financial barriers for students hoping to participate in the conference about world of diplomacy, negotiation, and decision making. 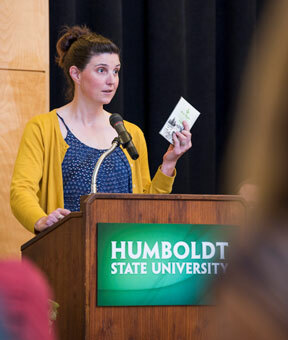 Special thank you to HSU alum and owner of Just My Type Letterpress Lynn Jones for speaking at the 2018-2019 Outstanding Student Awards Ceremony April 11. She did a great job representing HSU alumni! Come visit HSU! 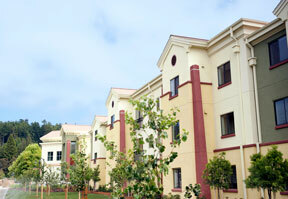 Humboldt State offers alumni affordable rentals in residence hall rooms during the summer. Spaces are available from June 1 through August 8, 2018. Saturday, May 12 is Commencement, and Forever Humboldt is seeking volunteers to help out in the Alumni Tent. 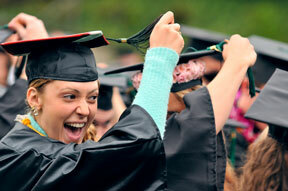 We’ll be helping new graduates register with Forever Humboldt and selling HSU gear. If you’d like to help out, email forever@humboldt.edu or call 707.826.3132. How much do you know about Humboldt State? You could win great Humboldt prizes! Just click the answer button to respond. Those sending correct responses to this month's question will be entered in a drawing for Forever Humboldt gifts. What was the name of the first university newspaper? Last month’s quiz asked, “Which HSU building was the first in the CSU system to be LEED-gold certified for its eco-friendly features?” Congratulations to Nicole Stathis (‘12, Sociology) for submitting the correct answer and winning the drawing: Behavioral & Social Sciences. 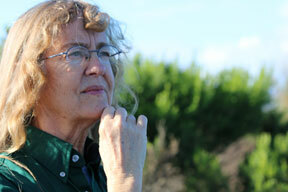 Student and professor in Forestry 331 measure tree water use and water status as it changes throughout the day. Matt Vallerga, Fisheries Biology, 1980, will be retiring from teaching on June 2, 2018 after 20 years in the classroom. He has taught third, fourth, and fifth graders with every combination in between! Not bad for a third and last career. Prior to being an educator, he spent about 10 years working in environmental sciences (air quality control, trace metals analysis, water resources, etc.). His first career out of HSU was about 10 years in seafood marketing and aquaculture. He is looking forward to recreating outdoors and traveling with his wife, Barbara. Lawrence E. (Larry) Liles, Political Science, 1969, dropped out of law school over a conflict with the role of law versus justice, which he learned later was a moral position. He completed a four-year union electrical apprenticeship, taught the same for four years, and then was elected twice as Business Manager for International Brotherhood of Electrical Workers Local 413 in Santa Barbara. He was appointed in 1992 as an IBEW International Representative in the Washington D.C. headquarters and worked primarily in their Research Department representing workers interests in many venues. He raised three stepchildren and two of his own. He retired early in 2010 to spend time with a late son. He’s now living in the Virginia Piedmont, the east side of the Blue Ridge Mountains, doing genealogy, and is active in Scouting and the SAR. Share news about the important changes in your life—like a career move, marriage, baby, community work, etc. Humboldt alumni are big supporters of HSU students and programs, and your gifts make a real difference. Your generous gifts through the Humboldt Loyalty Fund have supported scholarships, classroom technology upgrades, new lab equipment, and more. Thank you!